We arrive, 12:30. Comparison of Atlanta's Roach Motel to the Anaheim Hilton is almost impossible. Huge fountains fill the lobby; the 13 floors of rooms and hallways are now refered to as "The Rat Maze". Here's a pic of the Offical Convention Car, one per person so no extras were available for sale. Many AOL'ers are wandering around. Those sited include O2BFunny, Jacaust, CVN70Dog, Toizrit, UVBLaze and others. No sign of HWJunke yet! I passed out name tags with this logo on it to all of the AOL'ers who had requested them. As of now it is 12 AM and the hotel 'cops' are roaming the hallways telling everyone to close their doors. Its fire hazard to have your door open past 10 pm. ?? But I'm headed out... rumor has it that Strauss's room is worth checking. 11th floor, 315. Back out to brave the rat maze... wish me luck. The limited edition sale was another fiasco. The "stores" opened nearly an hour late, leaving everyone standing in a huge line for several hours AGAIN! However, the stuff they sold is pretty doggone cool!!! The pic below is five pieces made specifically for the convention. 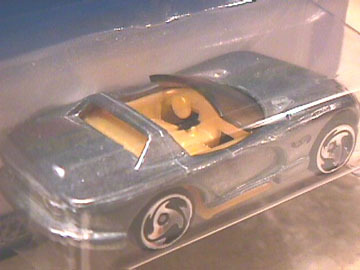 They also sold a ton of unpainted castings called "Zamac" cars. They appear to be clear coated and have a small black HW tampo somewhere on the car. These came in single blisters and a nice four pack. 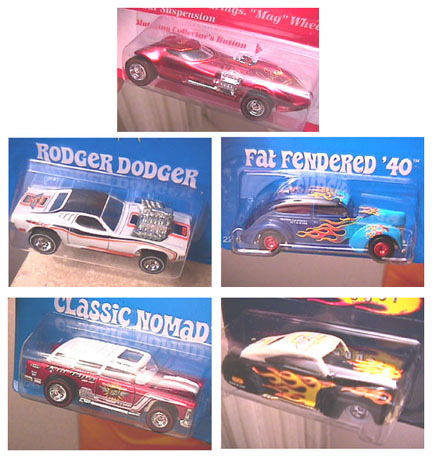 The single blisters are generally mounted on recent cards from 1998 series cars, apparently they used what ever card stock was current for each casting. I heard of as many as 25 different castings. I gave up at 19. At $10 a pop, it was pretty pricey also. 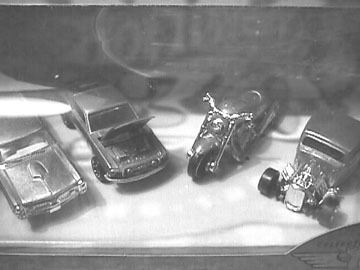 The four pack includes the GTO, the new Mustang casting (Avon), the Scooter and the 32 Ford. It is in box labeled for the Convention. No production numbers were announced and I have heard anything from 500 to 5000 of each. No one would say whether they would ever be produced for public consumption. 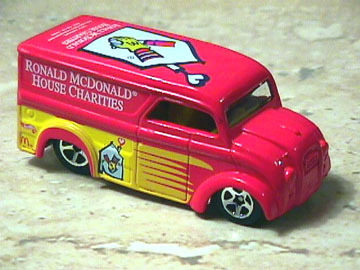 The Ronald McDonald car is the milk truck in red, NOT a code 3! Production numbers on this were stated at 5000. Hannah and I spent the afternoon waiting around on the Sizzler race which was scheduled for 12:00. Finally, at 4pm, it was cancelled because it interfered with Mattels XV Racers. 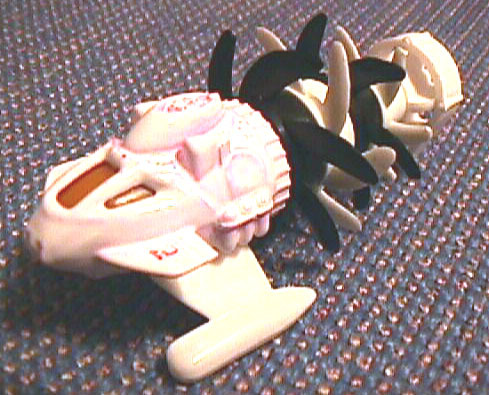 Only Current products are supported by Mattel's convention. The race was rescheduled for Sat at 4:00pm. Here's a new variation we saw today! 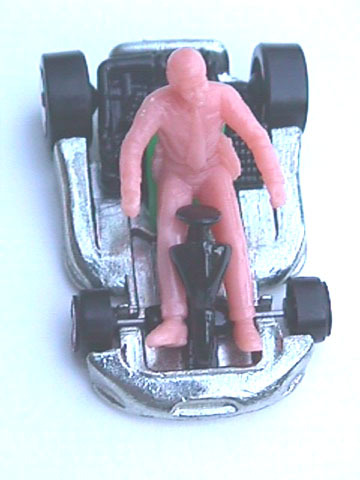 Tim Allen riding a Prototype Go Cart!! On a personal note, I upgraded my light green Double Header on Thursday and tonight I was able to upgrade my yellow Superfine Turbine! These were two of my major goals for the convention. On a lighter note, Greg Ford, fellow AOL'er identified a new spectraflame color tonight "Milky Ice Olive"! Look for it in the next edition of Tomarts! The Hallway Gestapo were out again in force tonight. They pretty well had the room trading shutdown byt midnight. They threatened numerous people with ejection from their rooms and a few people packed up and left on their own, disgusted with the whole deal. Today, I spent some time cruising the halls. The room trading here is a fraction of what is normal. The Hallway Gestapo were even out in the day time, hassling anyone who dared keep their door open. The Sizzler race was also a FIASCO. It was again rescheduled to 3pm with no other notification. By then, only six people bothered to show up. In spite of the small field, Hannah prevailed and captured a third consecutive first place. Mattel did not provide any prizes or trophies. My compliments and appreciation to Sizzler Joe and Sizzler Lee for hanging in there in the face of the total NON SUPPORT and for making a fun time for those of us who did participate. The RMCC Auction was a sight to see. 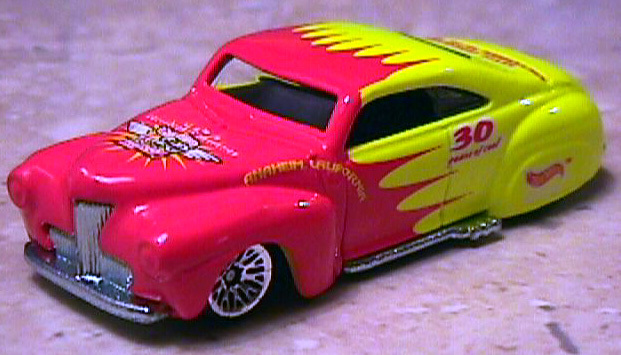 Mattel provided over 40 prototypes to be auctioned off, including a red Mach 1, a Tow Jam, a Hot Seat, Callaway, Go Cart, Catapult, Mustang Cobra(FE) and the Fathom This. They also provided four awesome 1/64th scale models of design concepts, developed for the convention. My favorite is the "Rocket Oil" truck. I sure hope it finds its way into production. It would make the bus and milk truck look like child's play. Unfortunately for me, the model sold for over $5000! However, I guess I'll be the first kid on my block with a "Fathom"! Another highlight of the auction was when it was announced that under various seats were placed "yellow stickies" which were good for a free tracks set, courtesy of Full Grid. The track sets were new "shelf warmers" not particularly interesting, at least to me. The BEST PART was watching Chris Marshall (O2BFunny) crawling around on his hands and knees checking out all of the empty rows of seats, desperately seeking a coveted yellow sticky. 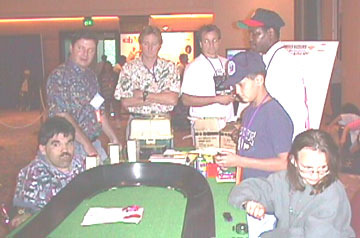 The finals of the "Racing for Pink Slips" were held. 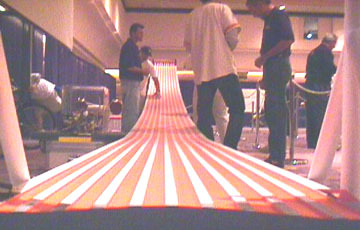 The track set up was very cool, ten lanes with a neato video capture photo finish system. The finished were projected onto huge screen, all over the hall. The winner collected over 600 cars including a dozen or so redlines and a bunch of extra special stuff thrown in by Mattel. After the Auction, the Hallway Gestapo were out in force, essentially preventing ANY room to room trading tonight. They even got to where they were stopping people in the hall and trying to send them back to their rooms! Tomorrow, there is to be more activities including a show, open to the public. We'll be outta here by noon, so this will be our last report. See my Website at The Superfine Site!